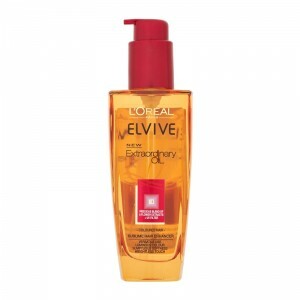 Elvive Extraordinary Oil is recommended for colour-treated, dry and damaged hair. It also works for sensitive, dry and normal scalp. You must test it. When to use Elvive Extraordinary Oil? Use nourishing elixir Extraordinary Oil if you often have your hair coloured and regularly use heat styling. The cosmetic is useful for repairing dry and damaged strands. If you’re a fan of blow-drying, straightening and curling, this product is for you. What are the properties of Elvive Extraordinary Oil? Action of Extraordinary Oil Nourishing Elixir comes from the components included. It is abounding in vegetable oils. Flaxseed oil nourishes and delivers lots of vitamins and minerals. Camomile and sunflower oils bring shine and softness. Lotus oil protects from UV rays and free radicals. Tiare flower oil shields hair and scalp from getting dry. Rose oil delivers elasticity. How to use Elvive Extraordinary Oil? You must follow some steps to enjoy the effects of Elvive Extraordinary Oil. First of all, wash your hair with a purifying shampoo. Then, apply a hair conditioner that will intensify the action of the oil. After the time given by the manufacturer, wash your hair and apply Extraordinary Oil. One pump is enough to fully nourish, repair and strengthen hair.